Time really flies when your avoiding responsibility. Or at least when I’m avoiding it. I’m amazed at how fast a year can go by when I’m about to do something tomorrow. Hey, I have a list like that too, but I keep it on my smartphone. And it has a lot more than 10 items. 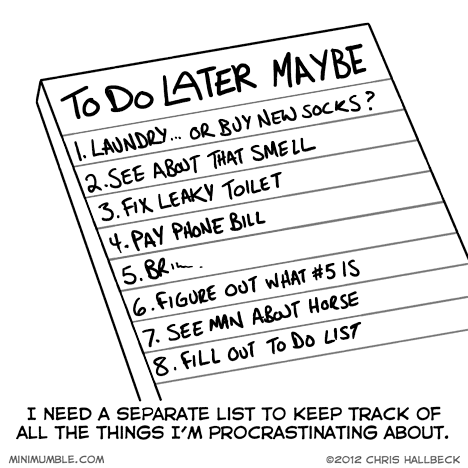 I have to remember to make a list like that for myself. *cough* I’ve bought new socks before a trip just to avoid doing laundry…. I dont even wash socks anymore….. its sad really lol. I do that with my mail. I keep everything sorted chronologically by soonest due date. If I don’t get around to it by the due date oh well, that’s why it’s called procrastination. I call it Laminar Filing. The bottom layers will soon be Coal!